The Leaf & Ember Guard that Works! EASY FALL™ Guttering have developed a new leaf & ember guard that can be fitted over your existing guttering. Based on the same principles as the full gutters Sydney system, the 4 leaf filters per metre allow even the heaviest rain to penetrate through the leaf and ember guard into your gutter while keeping leaves and debris out of your downpipes. Don’t miss our Animated presentation on the EASY FALL™ leaf & ember guard. 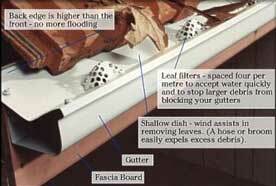 What are the benefits of buying leaf guards at Easy Fall Guttering? COLORBOND® will not melt from burning embers. 25 year warranty against rust. Shallow dish allows excessive debris to be hosed off easily. 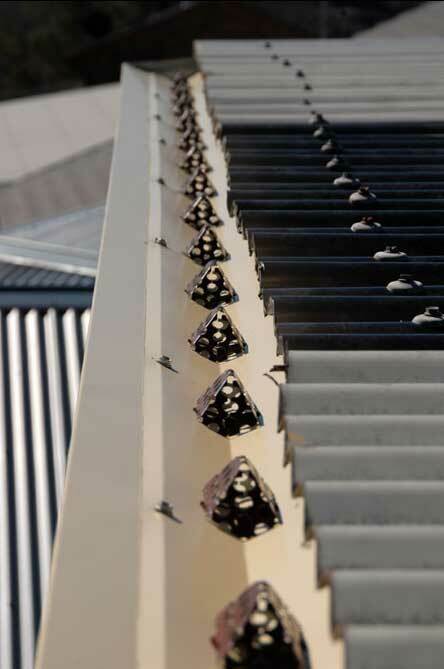 Adds considerable strength to your existing gutter. 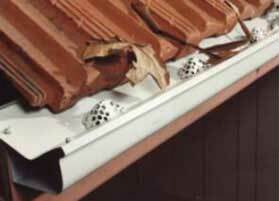 Can be adapted to suit all types of guttering. Oh, but I have a leaf guard already ..
Other leaf guards have been tried, and as you can see by these sample photos. They just don’t have the same effect. Why would you use anything other than The EASY FALL™ leaf & ember guard ? PLASTIC leafguards simply do not work LONG TERM. They tend to let debris into gutters, hot embers burn through them & deteriorate in sunlight. Don’t suffer from leaves blocking your gutters and causing blocked, overflowing gutters.